This is pretty cool. 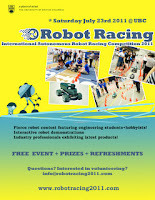 It is a competition that promotes research in autonomous mobile robotics technology. The course provides students with real world, hands-on challenges for engineering design challenges. 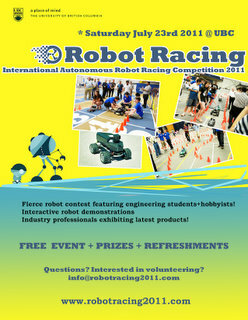 The robots that will race will need absolutely no human guidance or control! Very impressive. If I didn't already say yes to paddle-boating I'd totally be here. If robot racing isn't geeky enough for you, happening at the same time is MiniComi! It's a 1-day artists market inspired by those in Japan (eg. Comiket). There will be a lot of artists selling their wares which may include plushies, comics, prints, pins, jewelery and much more. 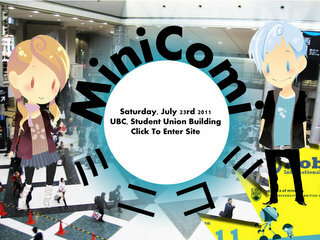 There is a high probability that there will be Cosplayers around too. Final aNix will be performing a concert after the market portion is done. Enjoy the sights, sounds and flavours of the Caribbean at Lonsdale Quay in North Van. There will be a parade, international food fair and craft market. Judging by the photos from the previous festival, this is a very popular event! 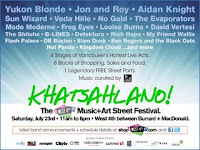 The parade on Saturday begins at Victoria Park (Keith Road & Lonsdale Avenue in North Vancouver). It winds around the park on the West side, and then turns South on Lonsdale. From there, it heads down Lonsdale to Esplanade, then turns West to arrive at Waterfront Park and terminate at Forbes & Esplanade. 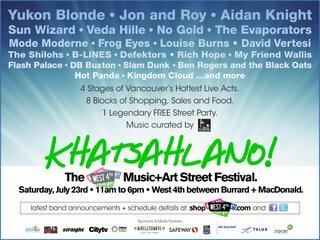 It's a BIG street party featuring 5 stages of live music, sidewalk sales, patio parties, food and Kitsilano's largest garage sale! RVSP at the Facebook event here. It's a major collaborative drawing event for people of all ages. No drawing experience is required, just your imagination and enthusiasm. Each drawing is started with one stroke and at least three people required to finish it. See the website for specific times and locations.